Zlatan Ibrahimovic insists the “lion is hungry” as he gets ready to start a fresh challenge with LA Galaxy. Zlatan Ibrahimovic completed a move to the MLS side last week, announcing his arrival by taking out a full-page advert in a local newspaper, after securing an early release from his contract at Manchester United. The 36-year-old, who has battled back from a serious knee injury, still believes he has plenty to offer in a Galaxy shirt. “I feel young. I said once before I feel like Benjamin Button,” he told a press conference. “I was born old, now I will die young. Don’t worry about my age. When I came to England they all said I was old and I came in a wheelchair. “After three months I conquered England and they said I was flying. This is only numbers. Ibrahimovic arrived in Los Angeles to a hero’s welcome on Friday, becoming the latest in a long line of superstars to sign for the Galaxy. David Beckham, Steven Gerrard, Robbie Keane and Ashley Cole have represented the Galaxy. “They called and I answered,” the Swede said. “They are the most successful club in the US, the MLS, and I think it is the right environment for me. “They are used to getting players from Europe in this situation and there are good people behind the club. I see the potential. 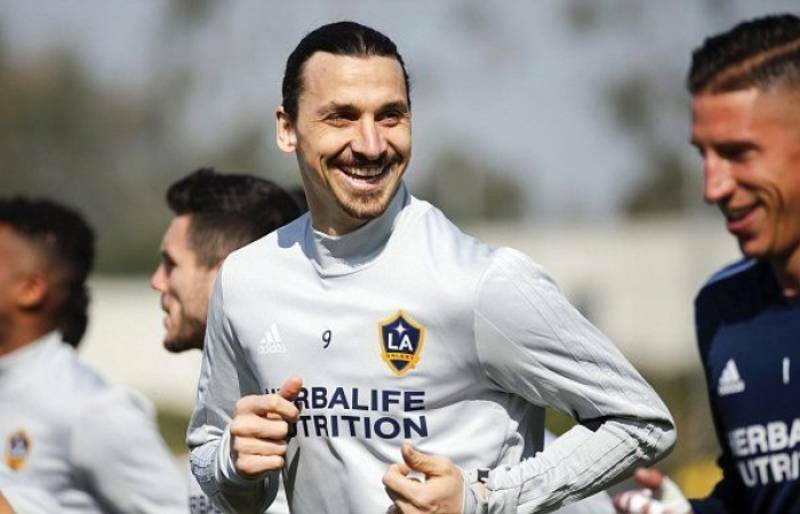 Ibrahimovic has met his new team-mates and had his first training session in Galaxy colours, putting him in the frame for a debut in the Los Angeles derby on Saturday. 0 Response to "Zlatan Ibrahimovic Has A Message For His New Club LA Galaxy: ‘The Lion Is Hungry’"